Posted on July 3, 2012 by tbean@illinois.edu. Recently, ECE Alumni Board President Chris George was able to announce that current and former Alumni Board members had come together to provide donations and pledges to surpass a set goal of $250,000. In recognition of this contribution, a room in the new building will recognize and honor the ECE alumni board . Nearly two years ago the ECE Alumni Board made a commitment at one of its biannual meetings to provide support for the new ECE building. Current members would contact former board members, asking them to join the effort to provide a group gift for the project. Posted on June 3, 2012 by tbean@illinois.edu. Philip Krein has been a key driving force for the new ECE building. He is the chair of the New Building Committee. He is regularly in touch with University and state officials, as well as the architect and building contractor, keeping abreast of the progress of the building. We spoke with him recently about the status of the building project to this point. 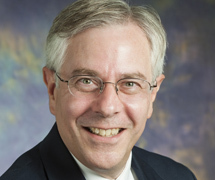 You can read the full interview with Prof. Krein on the Building Campaign for ECE Illinois site. Posted on May 3, 2012 by tbean@illinois.edu. Six ECE faculty took their love of running and used it to encourage student participation in the ECE building campaign. These six were all running in the Illinois Marathon. Teaming up with the ECE Student Advancement Committee, they participated in a fundraiser geared to current students. In the end, fundraiser brought in over $600 for the new ECE building. And one of the faculty ended up wearing a wig and cape as he ran along Green Street. See our online story to find out more. 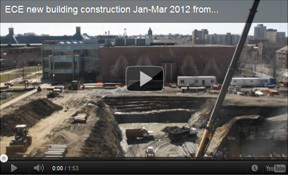 Time-lapse video of the construction of the new ECE building from January through March 2012 have been created. One view faces the east side of the new building (similar to our webcam). The other is from the vantage of the Beckman Institute. Note that there is a shift in the Beckman view as the camera is adjusted to show a section where more active construction is taking place. Posted on May 1, 2012 by Laura Hayden. With the building project moving into its fifth month, we sat down with ECE Professor Philip Krein, chair of the New Building Committee, to get his take on the progress of the building construction. Posted on April 1, 2012 by Laura Hayden. Posted on March 3, 2012 by tbean@illinois.edu. Construction of the new ECE building has been progressing rapidly. Photos of the February construction events are available in our photo gallery. In addition, the project continues to be available on our webcam. Nevertheless, our fundraising for this project still continues. Details on these programs can be found at the Building Campaign for ECE ILLINOIS site. The theme of our campaign remains “Do Your Bit.” Contributions at all levels are welcome. For all contributions over $100, donors will receive a special “I did my bit” lapel pin as a small token of our appreciation. Many companies have matching programs. You can check the U of I Foundation’s database to see if your company has such a program. This could be a great way to increase the amount of your donation. Corporate and multi-year pledges for major gifts are also sought. If you are interested in one of these larger gifts or in a multi-year pledge, please contact Beth Katsinas, Director of Advancement, at katsinas@illinois.edu or (217) 265-6285. 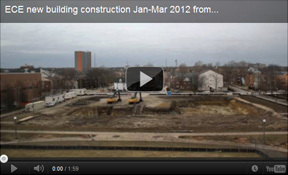 Posted on February 3, 2012 by tbean@illinois.edu. Soon after the beginning of the year, a fence was put around the site of the new ECE building. Topsoil was then removed (which will be stored for future reuse). Excavation of the basement has begun. Photos of the events through January are available in our photo gallery. As you watch the building go up, though, please remember that our fundraising for this project continues. Private funding is still needed to reach our fundraising goal for this building project. To “do your bit,” please visit the Building Campaign for ECE ILLINOIS site. Posted on January 13, 2012 by Laura Hayden. Work crews began bringing fencing and other equipment on to the building site on January 13. Once the fence was up, crews began work on site preparation. Topsoil will be removed and hauled away for later use. The plants around the site have been removed. Visit our photo gallery of these early construction phases. Live images of the construction can be viewed through our webcam. Posted on December 3, 2011 by tbean@illinois.edu. Their final bid amount was just over $71 million. This will be for the building structure itself. Other funds from the building campaign are needed for equipment, furnishings, and other items that must be in place when the building sees its first classes in session in fall 2014. Williams Brothers has worked on several buildings on the University of Illinois campus in recent years, including the Institute for Genomic Biology, the Alice Campbell Alumni Center, and the Illini Union Bookstore. Currently, Williams Brothers is involved in the renovation of Lincoln Hall and in the construction of Ikenberry Commons. Now that the Notice of Award has been posted, the contractor has 10 working days to submit documentation of insurance, bonds, and other paperwork. Once that has been submitted, an authorization to proceed is issued. At this point actual construction can begin. Construction of the facility is expected to begin later this month or early in January 2012. It will be ready for classes by the beginning of the fall 2014 semester. Though construction will soon be under way, our fundraising continues. Private funding is still needed to reach our fundraising goal for this building project. To “do your bit,” please visit the Building Campaign for ECE ILLINOIS site.